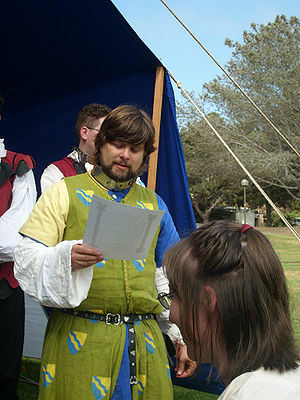 Master Lachlan of Cromarty has been in the SCA since 1985, and in the Kingdom of Caid since 1988, currently residing in the Barony of Lyondemere. He is also a soldier of the Third Auxiliary Dragoons. Lachlan is husband of Cassandre Nicole Loustaunau and father to Joaquin of Lyondemere and Miranda of Lyondemere. He is a Herald, fencer, painter, illustrator and scribe. Lachlan was made a Lord of the Pelican by Agrippa III and Dawid on 1/5/2019. Lachlan is a fourteenth century landowner with holdings on the Black Isle and in Sutherland, Scotland. His primary residence is above the town of Cromarty, situated on a point separating the Cromarty Firth from the Moray Firth. Lachlan also operates several vessels serving as halibut fishing boats and merchantmen. 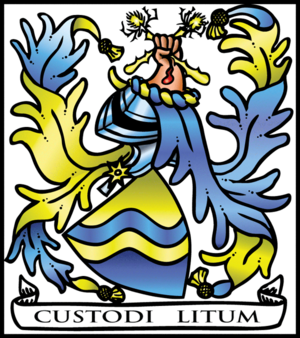 "Heraldry of the Barony of Lyondemere", The Tydes of Lyondemere, 1/2003. Describing in words and pictures the barony's arms and badges as well as explaining their proper use. "Caid - What if? ", The Crown Prints, 11/2007. A narrative retelling of the inception of the Kingdom name. Untitled photograph for article "War Report: Great Western War XI", Tournaments Illuminated, First Quarter 2009. "Squire Training - Day One", The Crown Prints, cover for 5/2012 issue (and GWW2012 Gate Book). "Caid Arms, Gelre Style", The Crown Printscess, 10/2012 issue. "Eilean Donan Castle", The Crown Printscess, 9/2013 issue. "CAID Monogram", The Crown Prints, cover for 11/2013 issue - nominated for a William Blackfox award. "Tilting at Rings", The Crown Prints" and "Crown Printscess", covers for 02/2014 issues. "Armorial Roll - February 22, 2014", The Crown Prints" cover for 07/2014 issue. "Wenceslas Leads His Paige on an Errand of Mercy", The Crown Prints, 12/2015, a scratchboard illustration. Many illustrations for Great Western War gate books. "Handling Mantling" with Tetchubah of Greenlake, Collegium Caidis 2012. "Compendium Caidis the Caid Wiki", Collegium Caidis 2014. 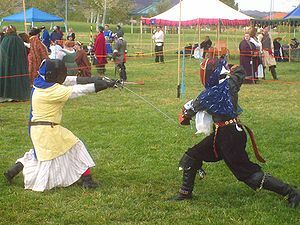 Discussed heraldic achievements and particularly mantling, Scribal Play Day 2015. This page was last modified on 7 January 2019, at 17:02.